Today, my husband reviews John Feinstein’s new book, The Legends Club: Dean Smith, Mike Krzyzewski, Jim Valvano, and an Epic College Basketball Rivalry. I assure you that his first draft was even less balanced and fair. He was delighted to receive my editorial assistance, you can imagine. Enjoy! Stuck in an airport with my iPad forgotten at home, I wandered into an airport bookstore and picked up John Feinstein’s The Legends Club, a book about basketball coaches Dean Smith, Mike Krzyzewski, and Jim Valvano, the first of whom was in his prime at North Carolina when the latter two were starting careers at Duke and N.C. State. Despite having read and enjoyed other Feinstein books on both golf and college basketball, I was anxious: the thought of a Duke alumnus writing about Coach Smith made my stomach churn. Still, I knew Feinstein had often commented favorably on Coach Smith, and I was desperate for something to read. I had settled into my American Airlines seat and removed the book from my briefcase when the woman across the aisle from me leaned over and said she’d just finished it – and loved it. “I’m a Carolina grad,” she added carefully. “I came away with a different impression of – one of the coaches,” and I just knew she meant Coach K. My curiosity heightened, I began. I’ll cut to the chase: I enjoyed this book. John Feinstein paints a highly sympathetic portrait of all three coaches, and, though it added little to my knowledge of Coach Smith, I was struck that he is the linchpin of the story. Feinstein takes great pains to portray him as more than a brilliant basketball coach – he was a great person who happened to also be an exceedingly competitive coach. President Obama awarded Coach Smith the Presidential Medal of Freedom not for his abundant on-court successes, but largely for his efforts to integrate North Carolina, beginning with a restaurant in Chapel Hill when Coach Smith was merely a twenty-something assistant basketball coach. Feinstein begins the book recounting a scene as a writer for the Duke student paper when he approached Coach Smith after a Carolina victory over Duke (which, in 1976, was routine) and was startled when – after introducing himself – Coach Smith said, “I know who you are. I read the column you wrote last month …. I thought you were very fair to us … for someone from Duke.” Later, Coach Smith asked Feinstein where he was from – New York City – and Coach Smith added, “Well, I guess that explains why you understand basketball.” Feinstein was enthralled by Coach Smith from that moment. 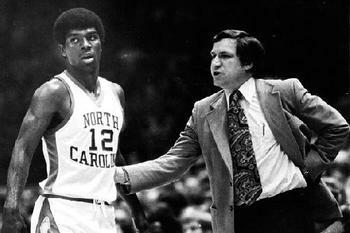 Coach Smith, as Feinstein recounts, was the measure for all other ACC basketball coaches during the 1970s. He documents how the coaches from Duke and N.C. State fled the ACC in 1980 for other conferences to escape the long shadow of Coach Smith. Both schools turned to young, comparatively unknown coaches in Mike Krzyzewski and Jim Valvano. Valvano had the earliest success, winning an improbable national championship in 1983 on a miracle shot, merely one year after a dominant Carolina claimed a national title. Jim Valvano comes across as he did in his later battle with cancer as a sportscaster: a raconteur with whom you’d enjoy drinking beers. A charmer. Someone who could talk. And recruit players. Someone who was distracted by life’s questions outside of basketball – and someone whose early success perhaps caused his eye to wander from his program. A slew of allegations later emerged around the N.C. State program and ultimately cost Valvano his job. Feinstein is generous to Valvano, but even Valvano admitted he got distracted from his essential duties as a coach. Valvano later found himself broadcasting for ESPN and loving it. It suited his gift for gab and his larger-than-life personality. His popularity peaked even as he faced death from cancer. A large part of his legacy is the Jimmy V Foundation, which strives to find a cure for cancer. In 2013 Krzyzewski and his wife were renting a home on Figure Eight Island on the North Carolina coach and ran into one of Coach Smith’s daughters while walking on the beach. They knew Coach Smith had a home there and they asked the daughter if they could come see her dad. She hesitated and explained that they should call her mom. They did, were invited to visit, and were stunned by Coach Smith’s condition. I won’t repeat all the details of the encounter, but it ends with Krzyzewski whispering in Smith’s ear, “Coach, I love you.” Two years later, he was one of the few invited guests from outside the “Carolina family” at Smith’s funeral; he wore a Carolina blue tie. It’s easy to see how the woman on the flight with me began to see Krzyzewski in a different light. I don’t think she’ll yell any less at the TV during a Carolina-Duke game, though. I know I won’t. I came away from this book knowing little more about Coach Smith, but a good bit more about Coaches Valvano and Krzyzewski (and others like Roy Williams, the current Carolina coach). Even as Feinstein adds more depth to my understanding of these coaches, the long shadow of Coach Smith still looms over the book; perhaps that is as it should be. And why I’d recommend the book. For an even more satisfying read, check out Will Blythe’s absolutely brilliant 2007 work, To Hate Like This is to be Happy Forever: A Thoroughly Obsessive, Intermittently Uplifting and Occasionally Unbiased Account of the Duke-North Carolina Basketball Rivalry. In getting three degrees from Carolina, I spent more time at Carolina than the John Belushi character in “Animal House” spent at “Faber”. The portrait of Coach Smith in the 1970’s is excellent, as is the entire review. Gus, you were brave to write for Jennifer. Jennifer, you were brave to edit Gus. A good marriage indeed! Coach Smith never lost a game. He just occasionally ran out of time. What a great review. Truth makes us more charitable, and maybe Feinstein worked on Gus’s soul! The sky is still Carolina blue…and Duke still the Devils! Thanks, Gus. Can’t wait to read it! I am a big fan of college basketball and especially the long rivalries in the ACC… this was a fantastic read. Feinstein really is a great sports writer!